The 120/230 VAC Lowel SoftCore Fixture With FLO-X1 Lamphead is one of the 3 fixtures in their SoftCore system of compact fluorescent lighting fixtures that accept the Lowel Rifa eXchange FLO-X lampheads. The quick exchange feature means you can rapidly change the FLO-X1 lamphead (which holds 1 lamp, not included) supplied with this fixture, to the FLO-X3 or FLO-X5 lamphead (holding 3 or 5 tubes, respectively). 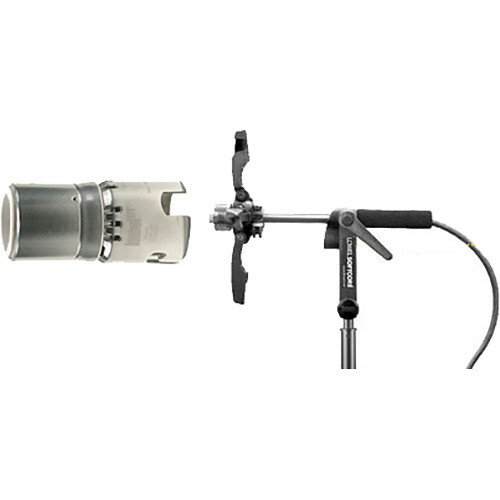 The unique 4-arm design of the fixture makes softboxes quick and easy to attach and rotate. When used with Lowel's 80W high CRI fluorescent lamps (not included), SoftCore fixtures deliver soft, accurate constant-source daylight. This fixture is supplied with the FLO-X1 lamphead and a 16' T1-80 AC cable. Lamps are not included.